Attended a wedding here last weekend. Drove all the way to Bulacan, without getting lost. :) (We got lost after, looking for the reception venue.) 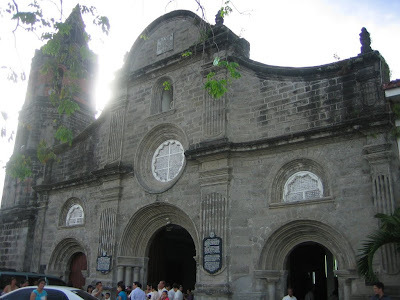 It was my first time to visit Barasoain church; I expected it to be larger... kasi diba dito nag-oath-taking si Erap? So all the while I thought it was a huge place (which could supposedly accommodate hordes of people). It's a normal-sized church. Okay lang, but I wouldn't want to get married here. Apparently, it's a popular wedding church so they have weddings here every hour. I didn't like how the commentator makes everyone hurry out after the ceremony and picture-taking because the next bride is already waiting outside, ready for her walk down the aisle. RENT, the 7th longest-run show on Broadway is coming to Manila again next month! What better way to spend V-Day afternoon than watching this Tony Award and Pulitzer Prize-winning musical with your loved ones? Doesn't have to be a date; in this SEASON OF LOVE, there's a lot of love to go around.